Microsoft's Bing for the third consecutive month increased its market share, accounting for 9.7% of US searches in the four weeks ending Feb. 27, up 4% from January, according to Experian Hitwise data. Meanwhile, uncontested search leader Google accounted for 71.0% of February searches, down 1% from the previous month. 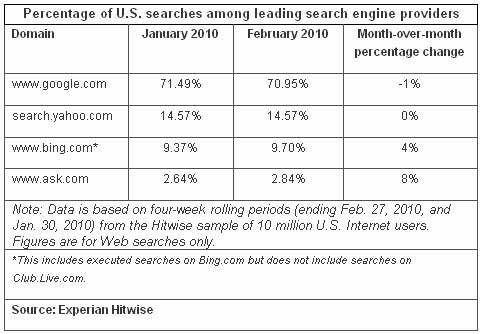 Yahoo Search and Ask.com received 14.6% and 2.8% of Feb. searches, respectively.